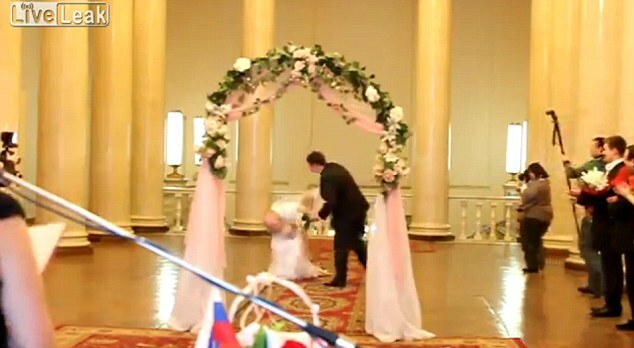 Is this the most embarrassing wedding moment ever? Video captures bride's skirt falling down as she walks down the aisle. It is supposed to be the happiest moment of her life. The bride walks radiantly down the aisle as her guests look proudly on and photographers bustle around to capture her special moment. But as she walks towards the garlanded arch to the tune of ‘Bittersweet Symphony’ her day suddenly turns more bitter than sweet. 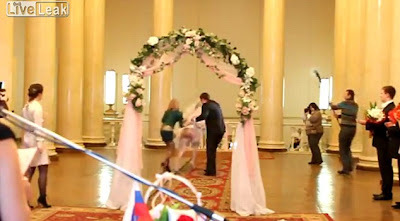 Unfortunately for the bride, the cameras keep rolling and her photographers go in for a close up. Her guests stay motionless - presumably dumbstruck - except for one blonde-haired friend who rushes over to help usher the bride out of the room. TO SEE VIDEO CLICK : MOST EMBARRASSING WEDDING MOMENT.